I have been very busy with various game projects lately and one of the projects is this new game from RETREAM called SkillGrid. The author (Simone Bevilacqua) of the game contacted me a while back and it didn’t take long before he sent me beta upon beta of this new creation of his. I had all of a sudden had become one of his testers without me even realizing it. – It has to be said that I and Simone go back and we have helped each other out before in the past so this ain’t a new thing but this is the first time i have been involved to this degree. 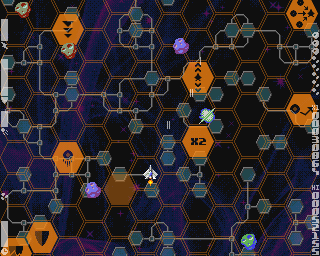 RETREAM have been doing games for a while and there have been several releases on the Amiga too, some of you might remember my Huension (Also available at Steam) review which was a very difficult game to understand at first but definitely not a bad game what so ever. Another top-notch title from RETREAM was the game BOH which for some reason I never got around to blog about (shame on me!). 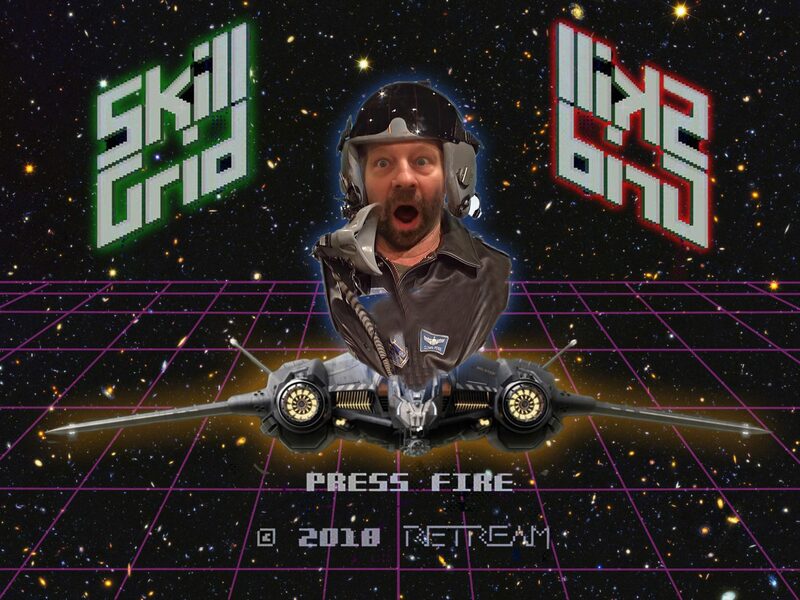 SkillGrid is first and foremost an Amiga 1200/A4k and CD32 Vertical Shoot Em Up game which means that it will run on all those setups and most notably on bog standard hardware like the Amiga1200 and the CD32 without any expansions etc. The type of the game though is rather unique as at first, it will look like a typical Shoot Em Up from the yesteryear but SkillGrid is different, way different to anything I have ever seen before, it is an Endless type of game with no level structures or such and yes normally I say – Boo! – when i hear the word endless but this time around I must admit that it is pretty interesting and rather fun. 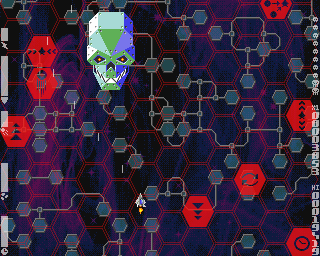 The game features many cool things and is also technically very good but maybe most of all it is extremely polished. You got 3 Layers of parallax scrolling and a static one on top of that for scores and such, the layers are dynamic and scroll at a variable speed depending on how you play and which pickups and most of all the longer you stay alive the faster it goes. A feature you don’t see too often in Amiga games these days are transparency, right? Well, SkillGrid got it and it is all over the place too (in a good way of course). 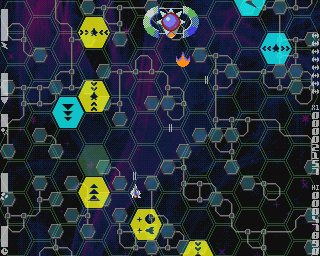 The controls are just about perfect too and it allows you to steer your ship with pixel perfection and dodge all those upgrades and downgrades you don’t want (or want perhaps?). You got Music and Sound FX while playing too which means that you won’t get sick of that shooting sound or whatever, even better is that there are some neat things happening while playing that will change the “sound” a bit when going faster. Weapon upgrades, speed upgrades, shields and so on. 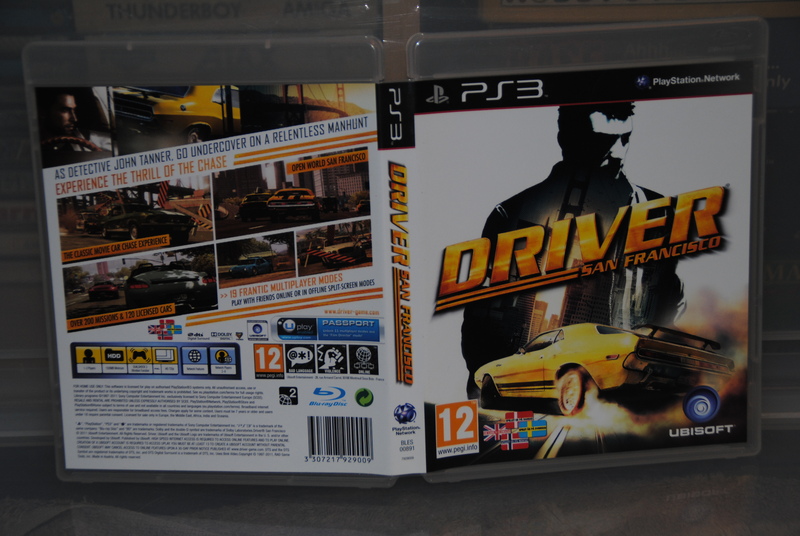 A huge manual, seriously… IT IS HUGE!... more about that very soon. There’s even in-game “speech” in the game. Pause button for both CD32 pad and keyboard. 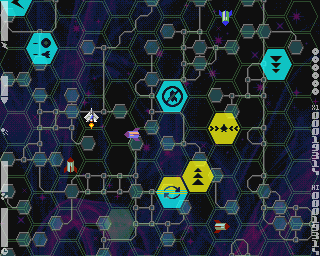 Minibosses, Asteroid fields, big bosses and mini-games and so on… there are so many cool things to be found in the game. All this and much more on just two 880KB floppy disks (or a single .lha/iso file for the other versions). (Updated/fixed) New screenshots as the old ones got corrupted, a new unannounced feature is shown in the right-hand picture. The first thing that hit me while trying the game was the insane size of the manual, everything felt overcomplicated and confusing at first and yes when i thought i had figured it all out is when Simone said that I played it wrong all along (DOH!). RTFM is my only advice to all of you gamers out there, I eventually spent enough time reading the manual and this is when the real fun started. I won’t mention too much of the game mechanics in this preview other than that it is based on upgrading and downgrading and there are several different colours to chose from. 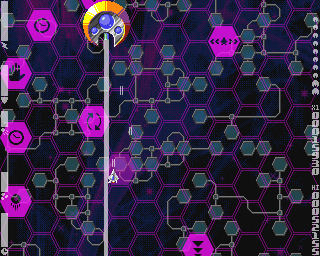 If you want to upgrade your ship then – YOU ARE SUPPOSED TO PICK UP CYAN COLORED OBJECTS btw (hello Simone :p). Yellow means DOWNGRADING and most of the time that is negative but not always! One of the most peculiar game decisions in the game is that your weapon is energy based and you can’t shoot like crazy which means that you can’t kill everything and that you will have to plan ahead a bit. My good friend RoarTJ did this Feature picture (of me inside SkillGrid) for the article, hilariously funny. Thanks again bud. 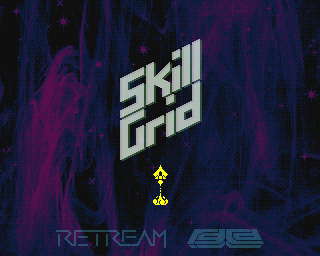 SkillGrid is out soon and it will be released both as a download title and a physical Floppy and CD version, the publisher will be RGCD and most retro guys know them for their C64 releases and maybe even other formats. EDIT: (Updated 07/12) I received some very sad news right after I published the article yesterday, SkillGrid has been delayed until early 2019, the reason for this is the production of the physical edition, there will be ongoing changes and updates on the game until the finished product is done so all in all this is positive for the game itself. I have attached a Video of the latest preview, watch it with caution as it might make you want the game too much and will make the wait even more difficult now that my hype is done. Simone Bevilacqua is back on track? Didn’t he say he had left the coding businness after Huenison? Anyway …. Simone rules! And yes, we should write a post about Boh, and about how Simone allowed for a dev kit inside it to make (and share) your own levels!!! Hey G0blin, you’re right, at some point I had left development for good. I tried to force myself to. It’s a long story. Eventually, I couldn’t stay away from creating video games, so I made MAH and QUOD INIT EXIT IIm for the C64. Last year, I decided to return to the classic Amiga to have fun with programming its hardware, and I ended up making SkillGrid (and writing other stuff that I hope to use one day for other games). Simone, I’m glad you didn’t stop developing. I almost left myself, after finishing Middle City. It just drained all my will out. But thanks God, at a certain point I went back to coding and I have new projects in mind. I will get back to you via mail.